Composite sandwich constructions are very widely employed in the modern aircraft industry, honeycomb panels among them. The principal defects of honeycomb sandwiches are cover detachment because of cell collapse or poor adhesive, which can lead to water penetration in cells. Recently, the thermal method of non-destructive testing (infrared thermography) has begun to be applied to the diagnostics of honeycomb constructions, and has some advantages over traditional methods. However, thermal processes are transient, and this complicates the selection of optimal parameters for monitoring. 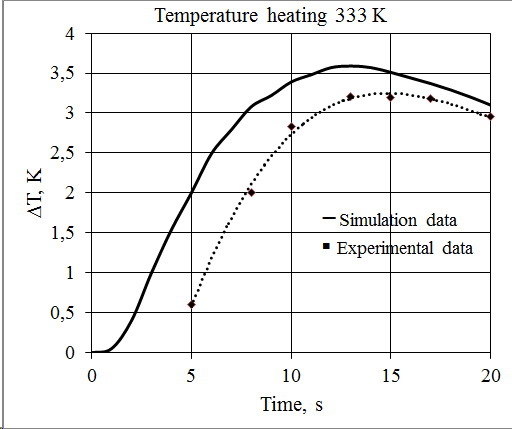 The purpose of this work is to investigate the possibilities of the thermal method for honeycomb panel inspection using computer simulation. The COMSOL Multiphysics package was used for the simulations. A 3D model of the honeycomb panel was proposed, and two possible defects considered: the detachment of the panel cover from the filler and the presence of water in the defective cell. The implementation of the proposed 3D model made it possible to investigate the effect of a defect on the thermal field of the panel surface. The simulation results showed that optimal testing time is significantly different for various types of panels. The correct selection of testing parameters increases the accuracy of the testing procedure. The results of experimental investigation confirmed the adequacy of the proposed model for thermal testing. Multi-layer composite materials are widely used in modern aircraft construction. They are characterized by high strength and low specific gravity (Ibarra-Castanedo et al., 2007). In aircrafts of the latest generation, more than 30% of the fuselage, wing, keel and other parts of the aircraft are made of honeycomb panels (Vavilov & Nesteruk, 2005). The principal defects of honeycomb sandwiches are the detachment of the cover from the filler due to the non-gluing or crushing of the cells. These defects can arise both during the operation of the aircraft and during the manufacture of honeycomb sandwiches, because of process violation. The most dangerous defect is the ingress of water into the cellular structures of the airplane elements (Meng, 2008; Oliveira et al., 2011). At low temperatures, water freezes and increases its volume, which leads to the destruction of honeycomb cells and significantly reduces the strength of the entire panel design. The traditional methods of defect detection in composite materials include ultrasonic non-destructive testing. However, this has a low productivity and needs contact. The less common method in aviation is the X-ray method. Its application is limited due to its cumbersome technique and safety risks for personnel. Recently, the active thermal method of testing (active thermography) has begun to be applied to the diagnostics of composite materials, as it allows users to identify any defect in the material structure (Galietti & Palumbo, 2016) and has certain advantages over traditional methods. It is non-contact, allows the exploration of large areas in a relatively short time, and poses no risk to the safety of personnel (Sánchez-Carballido et al., 2014; Yu et al., 2014). Thermographic techniques use an external heat source to excite thermal waves in the material. The presence of a defect causes various thermophysical local properties of the material, which leads to abnormal temperatures on the material surface. The ability of thermography to detect defects in honeycomb panels has been demonstrated in various works. The use of pulse thermography to detect the penetration of water into composite honeycomb panels was investigated by Meng (2008), Oliveira et al. (2011), and Xingwang and Feifei (2012). Zhao et al. (2011) researched pulse thermography to detect not only water but also hydraulic oil in sandwich panels. The quantitative estimation of water content in aircraft honeycomb panels using transient infrared thermography was carried out by Vavilov and Nesteruk (2005). The active infrared testing method is successfully applied to the inspection of the condition of aircraft structural elements in companies such as Airbus Industry, Inc. and Boeing. Although this method of testing has begun to be applied in industry, the received results of the research are insufficient for its full and wide application. The influence of material structure parameters and heating parameters on the detection effect has not been studied completely. In addition, there are some problems connected to flaw detection in honeycomb structures made of aluminum alloys and composites. Aluminum constructions have high thermal conductivity, which provides transience of all heat processes; this impedes the testing procedure. Composite structures retain high temperatures for a long time. This enables the tester to obtain a more precise result. Thus, different honeycomb structures need to be inspected using different modes of testing. The purpose of this work is to investigate the possibilities of the thermal method for honeycomb panel inspection using 3D computer simulation, which will allow us to visualize processes that are invisible to the researcher. The obtained results confirm the possible applicability of the COMSOL Multiphysics package to study the processes that occur under active thermal testing of honeycomb panels. Honeycomb panels are of a complex composite material, the constituent parts of which have different thermophysical properties, which significantly affects the parameters of thermal testing. The implementation of the proposed 3D model for computer simulation makes it possible to investigate the thermal processes that occur inside the object during testing, which cannot be determined experimentally. This makes it possible to preliminarily determine the necessary testing parameters, namely, the optimum monitoring time and the heating temperature for each specific case. This improves the accuracy of monitoring the honeycomb panels. The results of experimental studies confirm the adequacy of the proposed model of thermal testing.